Two homes on Dodson Avenue burn Saturday morning. The homes were vacant, and the cause of the fire is under investigation (Photo by Lt. Scott Powell with Hamilton County EMS). Two homes on Dodson Avenue were engulfed in flames Saturday morning, taking 40 firefighters roughly an hour to get the blaze under control. 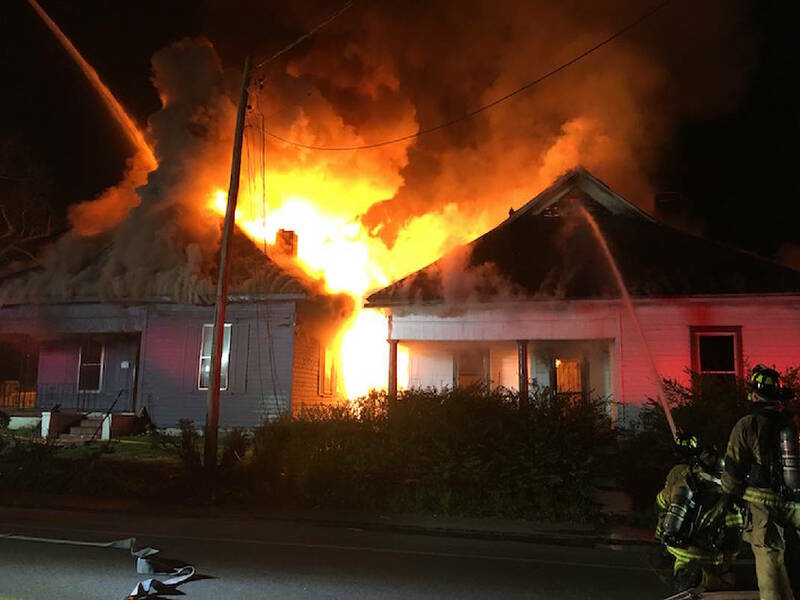 Firefighters responded to a house fire shortly after 11 a.m. where they found the back side of two homes located at 610 and 612 Dodson Avenue burning, according to a release from Chattanooga Fire Department spokesman Bruce Garner. Firefighters went into the homes to search for people. Eventually, the fire became too dangerous as it had broken through the roof, and firefighters were ordered out of the homes for safety. A second alarm was called for additional firefighters and equipment. Eventually, responders got the fire under control and were told the properties had been vacant for some time. No injuries were reported.